December Volksfront Event in Calgary: Is C18 Invited? To tell this tale, we're going to jump between Stormfront and Blood and Honour / Combat 18 (B&H/C18) forum discussions. While Volksfront itself has been around for a few years, but they're sort of the new kids on the block in Calgary. 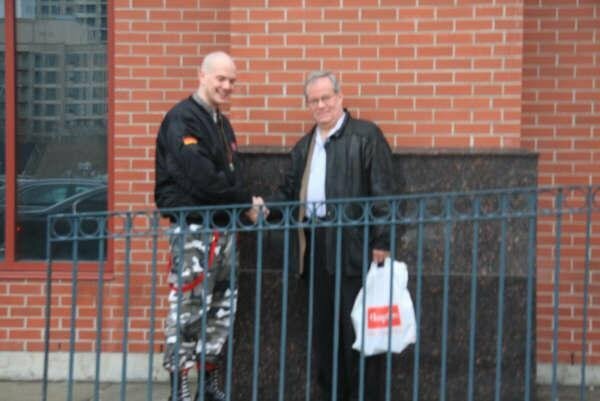 Of course given their affiliation with the Blood and Honour faction opposed by the Combat 18 affiliated faction, their presence in Calgary might be seen as problematic by the Aryan Guard, most of who's members have put on a C18 patch. "O'neil bc" was, and still seems to be, very much involved with Volksfront in British Columbia. We don't know if he's in any leadership capacity, but that's not all that important now. The group in Calgary appears to have Scott Sinclair running the show. Sinclair is from Manitoba but has spent time in the Atlantic provinces with the boneheads out there and has been in Calgary for some time now. This past Friday many boneheads commemorated the 17th anniversary of Ian Stuart Donaldson's own curb stomping. Ian Stuart, after returning home from an evening out with some friends in Burton-on-Trent, Staffordshire, died in an automobile accident, when his car spun out of control and ended up in a ditch. One passenger died instantly, while three others received neck and back injuries. Stuart was rushed to a hospital, and was pronounced dead the following morning. Despite such a high-profile death, there was no major investigation by the authorities, leading many to speculate everything from foul play to a staged fake death. Some insiders say Stuart had become disillusioned with the movement he had created, and might have, with the help of higher powers, staged his own death in an attempt to remove himself from the situation. And as such we thought that we would use this opportunity to again act in a childish manner and make fun of his worshipers. Earlier that month, on July 3, the woman had been sitting in her living room when she heard a man outside making gunshot noises. She looked out her front window and saw her neighbour, Martin, on the sidewalk making gestures with his hand as if he were shooting a gun at her house. Nine days later, the woman heard Martin and another man in the parking lot outside her bedroom window. They were loudly singing songs with racially offensive lyrics and yelling, "Go back to Africa." The woman filed her first police report the next day. Two days later, as she and the 11-year-old girl were walking to the local variety store, they were confronted by Martin and Gill. Martin again made the gunshot noises and the sign of a gun in her direction. When the men began to spew their racial slurs, the woman and child turned and headed for home. The woman told police Gill was close behind them as they ran inside the house and locked the door. Gill then began to pound on her door. Once inside, the woman, the young girl and the child's mother moved to the middle of the home for fear that the men would break windows. After police arrived and took a second report, the two women took turns sitting guard on the porch through the night in case of further trouble. We have to admit that we are torn when it comes to covering Paulie's futile mayoral campaign. On the one had, we find it funny as hell that he's going to be thumped by an 89 year old woman and that there has been absolutely no mainstream coverage of his efforts. On the other hand, we're providing him with publicity by writing about him. Your name is Bernie Miller. Hell, we've known who you are, as well as Eric, Bill, Jonathan, Trevor and others, for months. Did it occur to you that maybe the reason why we haven't written much about you is because there's nothing much to say about you? Sorry, but your significance is pretty much nil at this point. We do like the Kevin Goudreau avatar though. That sort of made us laugh a little. We'll preface this entry by stating it really is important to stay awake in history class. You never know when what you learn will become important for practical purposes. We wrote a few days ago about how Paulie wasn't having a hell of a lot of luck drumming up mainstream media attention for his campaign (perhaps, being burned by covering his protests of Tamil refugees as if he were a legitimate person of interest and not the Pied Piper of the Canadian bonehead scene, they opted not to write much about a man who will be crushed in a municipal election by an 89 year old woman). Not to say that no mainstream news source will give him a forum, but it hasn't happened yet. Until now, Paulie has had to be content to brag about appearing on an Internet radio program hosted by another failed politician and confirmed racist himself. Remember the story about Richard Martin and another schmuk being arrested for ethnic intimidation? A pair of hate-mongers will be sentenced Thursday for threatening behaviour and racially motivated harassment of a young black woman who lived on their street. Yes, this one is especially interesting. We remember the folks on the Blood and Honour (C18) blog making comments about Reitmeier and his choice of photographic partners. We also seem to recall Marleau writing a thing or two about it. Suffice it to say, they were none too pleased as accusations of "race traitor" were posted. We wonder if Paulie is going to grow jealous of Winnicki? We reported that Tomasz Winnicki announced on both Stormfront and VNN that he was running for mayor of London. That same day, Paulie made his announcement on Stormfront and his Facebook page that he had filed papers to run in the Mississauga mayoralty race. So, who's announcement has garnered more media attention? Not Paulie.